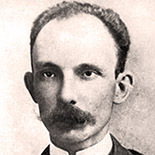 José Julián Martí Pérez (January 28, 1853 – May 19, 1895) is a Cuban national hero and an important figure in Latin American literature. In his short life he was a poet, an essayist, a journalist, a revolutionary philosopher, a translator, a professor, a publisher, and a political theorist. He was also a part of the Cuban Freemasons. Through his writings and political activity, he became a symbol for Cuba’s bid for independence against Spain in the 19th century, and is referred to as the “Apostle of Cuban Independence” He also wrote about the threat of United States expansionism into Cuba. From adolescence, he dedicated his life to the promotion of liberty, political independence for Cuba, and intellectual independence for all Spanish Americans; his death was used as a cry for Cuban independence from Spain by both the Cuban revolutionaries and those Cubans previously reluctant to start a revolt. "A grain of poetry suffices ..."
"Men are like the stars; som..."
"Others go to bed with their..."